"Find our schedule and menu on @goodfynd! 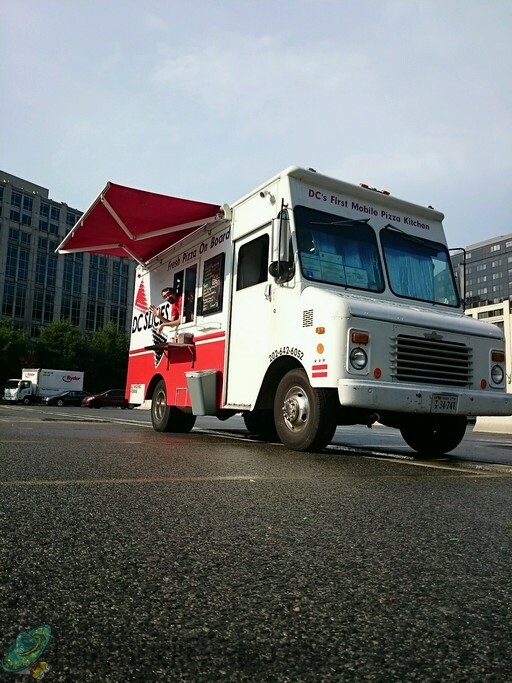 "... Thu, Apr 18  11a - 2p " Capitol South Metro  https://t.co/OsqbXabw3L... https://t.co/CTm3aaDclz"
It's not bad, just not great, it's an over priced average slice of pizza. You are probably better off ordering a medium from dominoes or papa johns and may end up waiting less time. Don't buy the hype. The bacon and cheddar tots were an *extreme* disappointment, especially for $6. They felt like they had been sitting in a warming pan all day and lacked any flavor. The cheese was completely baked, no gooeyness. Shoulda stuck to the two pepperoni slices - those were excellent as usual! The slice was good. Probably a little expensive at $4...I think $3 is the better price point (and at which I would have bought 2 instead of one $4). The slice was good. Probably a little expensive at $4...I think $3 is the better price point (and at which I would have bought 2 instead of one $4). But it was a fairly good size. Soft inner crust with a crisp edge. The best part was the chewy nature - the cheese was baked solid with some browning - just like dad makes it in the oven back home. The sweet potato tots were also very good, and plentiful. Hot out of the fryer after a ~5 min wait. One container of ketchup was just right for the volume. All in all, I loved the food. I would have given it 5 stars, but I think each selection is slightly over priced. $10 for 2 slices and a little less tots would be the ideal price point for me. Food is good, but the service is agonizingly slow. In the past I've been willing to make the sacrifice because the pizza is delicious, but things just seems to be getting worse. It took 20 minutes to serve the 7-8 people ahead of me. On another occasion, I was the second person in line when it was supposed to open (11:30), but they didn't end up opening their windows until 11:55. Unfortunately, I will not be visiting very often if this keeps up. This truck is very polarizing for me. On the positive side, I really enjoy their pizza. Thin crust, great flavor, and very accomodating staff when asked for little extras like some extra sauce on the side. Plus any food truck lunch for 8 dollars or less is great.On the negative side, and this might be just a testment to how popular they are, the line always seems to be too long and moving too slow. Food preperation is certainly not my forte, but it would be nice if they were ready a little earlier and more fully stocked when they opened to keep things moving quickly. Nothing to write home about. I thought the tomato sauce would have a very hearty, rich flavor but there wasn't any. Just your average slice of pizza. I just got back to the Office to give my slice a try. It was cold as a stone. The nice lady pulled it from the glass box, which I thought was a hot box. But I guess not. Sorry to complain. But I just like warm to hot food. Pizza tasted good. I don't believe these reviews. Not at all. 4 dollars for a nondescript pizza. It's an economic slice, it's okay at best. Won't be back. Again, I don't for one second believe all of these wonderful reviews for a very average product. Five stars for the pizza, one star for always being open late. I work an early shift and eat lunch at 11. 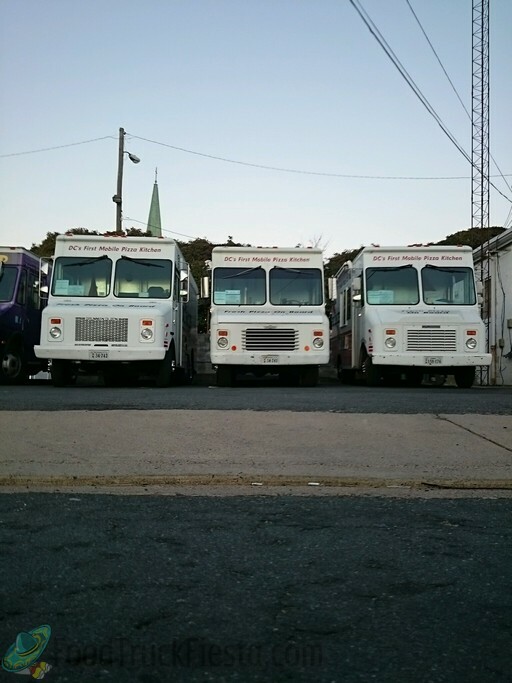 All the other trucks are usually serving by then. I held out until 11:45 one day and still closed. Need to get out of bed earlier to make some more money. I bet I would have had your pizza 20 more times by now if you were open by 11. Great pizza! Thin but not soggy. Just the right amount of sauce. The tots are to die for as well--nice and crispy. Great service. 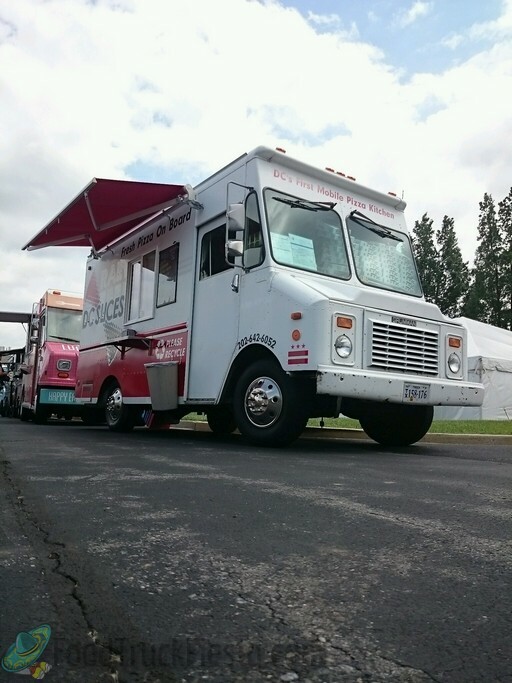 You can always tell a good truck by the size of the line,and this one always has one! 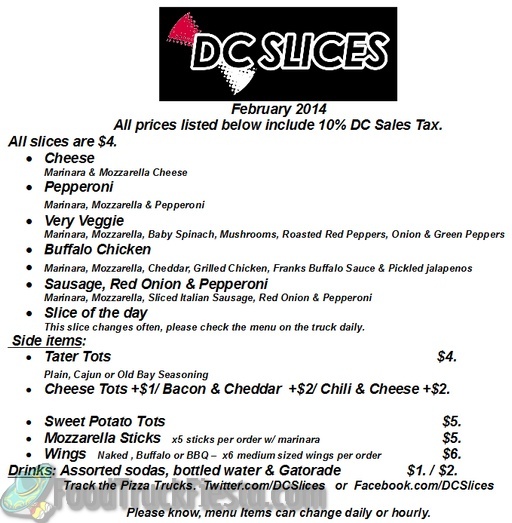 DC Slices serves fresh thin crust pizza that is much less greasy than your average jumbo slice; some say it’s healthier. Taking a very distinct stance on how pizza should be created often elicits love it or hate it responses from customers. 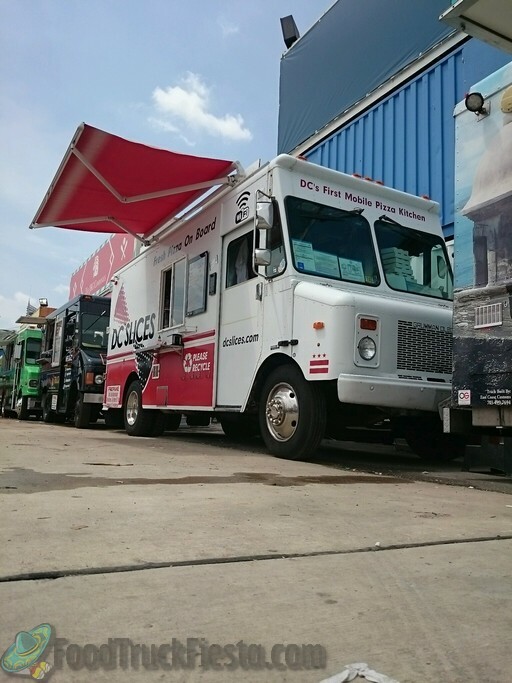 Always attracting a long line of customers and playing an endless supply of popular music from the truck, DC Slices seems to have found a sweet-spot in serving style. Pro-tip: always ask for fresh basil on top of your slice.